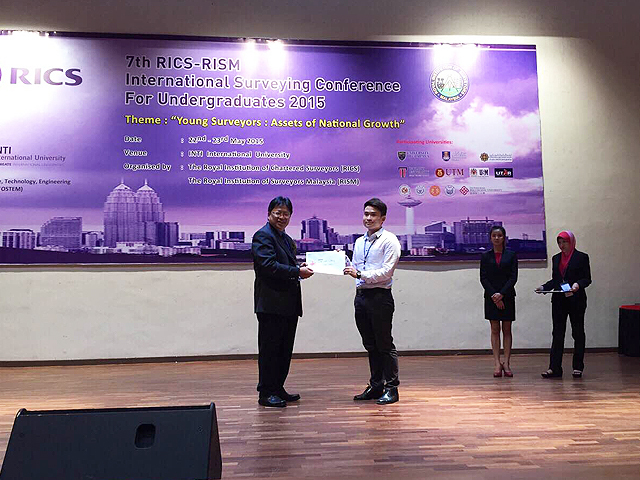 UTAR Year student Lim Che Liang was awarded “Best Presenter” for his paper, “The Impact of Proximity to LRT Station and City Centre on the Value of Condominium in Kuala Lumpur”, at the 7th RICS-RISM International Surveying Conference for Undergraduate 2015, held on 23 and 24 May 2015 at INTI International University, Nilai, Negeri Sembilan. Che Liang is currently a Year Four undergraduate student in quantity surveying. His paper aims to find out how the proximity to LRT station and city centre affects the value of condominiums in Kuala Lumpur. “The study aims to establish a regression model to explain the relationship between the property value of condominum and the proximity to LRT station and City Centre”, said Lim. “I am really pleased and honoured to be awarded the best presenter for Parallel session 7 on behalf of UTAR. It means a lot to me. I would like to thank my advisor, Dr Chia Fah Choy for guiding me”, he said with a smile. Besides UTAR, the other participating universities were Universiti Malaya, Universiti Teknologi Malaysia, Universiti Sains Malaysia, Universiti Teknologi Mara, Taylor’s University, Assumption University, International Islamic University Malaysia, Hong Kong Polytechnic University, ChongQing University and Huazhong University of Science and Technology. This year’s theme, "Yong Surveyors: Assets of National Growth", was a plaftform for undergraduate students pursuing quantity surveying in universities across Asia Pacific to learn, exchange and also share their undergraduate research papers. This annual conference is organized by the Royal Institution of Chartered Surveyors (RICS) and The Royal Institution of Surveyors Malaysia (RISM) together with participating universities.